Gives the look of elaborate face paint--without the paint! Ready for the big game day? You’ve got some great tickets, a fantastic tailgating setup complete with grill and the best stuff to put on it, and you even remembered to bring the defense signs! Your friends are all crazy hyped to cheer on not only the greatest East coast team, but the greatest team of all time! But wait! You completely forget to grab face paint before the game! How will you be able to rep those fantastic blue, green, and silver all over your body? For a super fan like you, throwing on a jersey just isn’t enough. You need to create as much hype so you can transfer it all to yet another Seahawks victory! 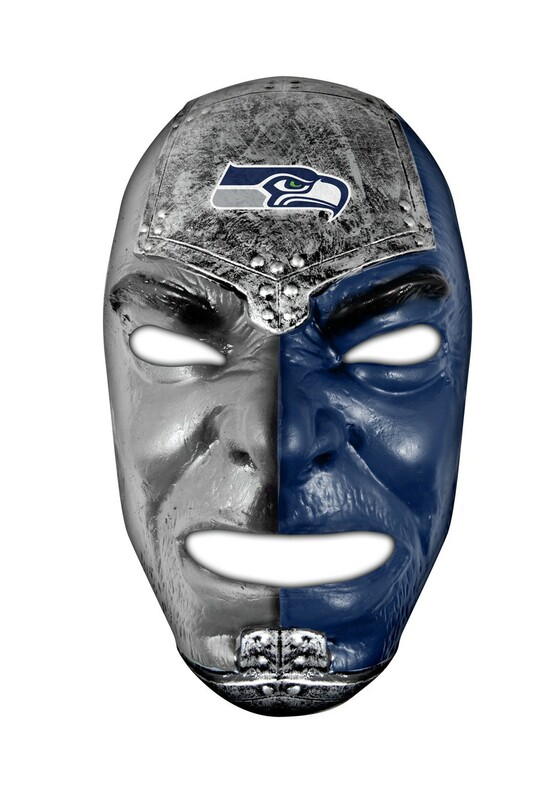 When you’re at CenturyLink Field, the team knows they can count on their 12th man, and you’ll finally look the completed part with this mask. After all, it’s modeled after the game-face of a true football fan! From the couch, to the tailgate, to the stands, you’ll never be able to leave home without it! Standard Size 6" x 9.5" 6" x 9.5"